Pierre-Emerick Aubameyang proved the match-winner for Borussia Dortmund in their win over Mainz. Pierre-Emerick Aubameyang delivered the perfect riposte to the gauntlet thrown down by Robert Lewandowski on Matchday 1. The Gabon striker scored both goals in Borussia Dortmund's 2-1 opening day victory over 1. FSV Mainz 05, meaning the race for the Torjägerkanone is already well and truly on! Is Aubameyang in your Official Fantasy Bundesliga side? If not, sign him up now! After Lewandowski's hat-trick on Friday, Aubameyang sent the Pole a congratulatory tweet proclaiming the battle to become top scorer in the Bundesliga to be on. And the Dortmund striker was true to his word with a match-winning brace on Saturday. The votes poured in on our Twitter poll to find the first #BLMVP of the season - and the 27-year-old's performance was enough to land him top spot. Congratulations! 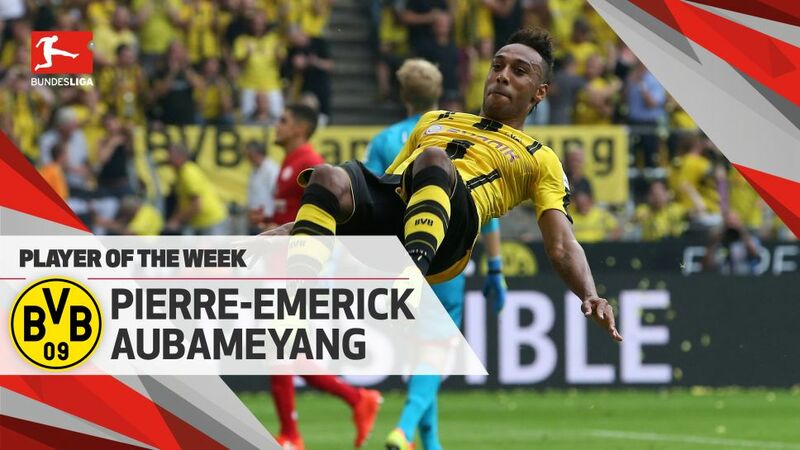 ...Aubameyang has found the net on three of his four opening day appearances in the Bundesliga...and has taken his Matchday 1 tally to an impressive six in total....the reigning African Footballer of the Year only needed four shots on goal to complete his brace....his performance would have earned 15 Official Fantasy Bundesliga points!